This is a story of a success, a surprise discovery and the hazards of not paying enough attention or making assumptions. Oh to be in Ireland where it’s possible to check the primary records! Photo by Ingo Mehling, 2010. from Wikimedia Commons. I’m a great fan of ensuring I have family certificates and I used birthdays etc to gain a good repertoire of my key family certificates. Somehow I’d missed getting Mary Callaghan McSherry’s…who knows why. Thanks to the new Queensland online BDM search and online ordering I was able to rectify that yesterday for a mere $20. In a matter of a minute there it was to review. Bingo!! There was the proof I needed: her father was indeed David Callaghan, a fisherman, as I knew from her marriage in Gorey, but it also states that she was born in Courtown Harbour. This confirms that the David Callaghan I’d hypothesised as her father is the correct one, though I still want/need to see the baptism registers. I alluded to this in my earlier post. I’d done a google search using the words: Callaghan fisherman Courtown Wexford. To my surprise up popped a book extract which was something of an eye-popper. Margaret Callaghan, daughter of Edward Callaghan (who in turn is said to be the brother of John and David fishermen in Courtown), turned out to be the wife of Ace of Spies, the true story of Sidney Reilly. The book by Andrew Cook is available as an e-book so of course I couldn’t resist buying it to see more detail. My good fortune is that it also includes detailed footnotes on the Callaghan family, some of which I’ve been able to cross-check using Family Search and FindMyPast (world) (FMP). Other aspects I’ve been unable to verify eg Margaret has eluded me in the 1891 English census. Critically the book’s footnotes identify Edward Callaghan’s place of birth in the parish of Ballygarrett, in which Courtown is situated. Why is this important? Because at least one of my DNA matches has traced his family to the same parish, but our match is too strong for this to be “identical by state.” The book also identifies Edward’s parents as John and Elisa Callaghan[i] so tentatively they would also be the parents of our David. 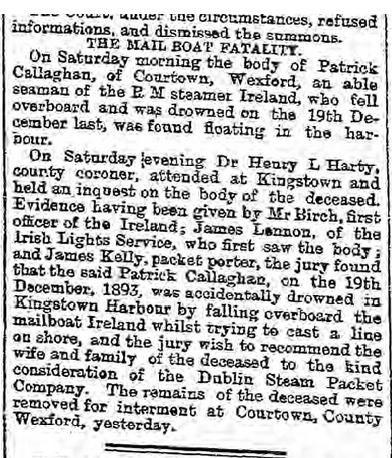 The report on the drowing of Patrick Callaghan of Courtown. Might this have been Kate’s husband? Freeman’s Journal 26 February 1894. According to the Irish Deaths Index he was 33 years old, est YOB 1861. Error 1: I had stupidly blipped over the marital status of David Callaghan’s family in the Household Returns for the 1901 census. Kate Callaghan was not David junior’s wife, she was a widow and he was unmarried. As yet we don’t know which of David Callaghan senior’s sons she had married. I have now edited my previous post to correct this. Error 2 was assuming that the Anne Callaghan on the Griffith Valuations may have been David and John’s mother whereas in fact it may be that John Callaghan, also living in the Oughton houses may be the correct ancestor. An assumption, in my head at least, was that Anne Callaghan who was admitted to Wexford Gaol for stealing a chemise may have been the same one as on the Griffith Valuations. This may be the case, but she may also be the wife of David Callaghan as we can see from the birth entries identified below. She was 45 in 1877, suggesting an estimated year of birth of 1832. She could be a sister of David Callaghan (est YOB 1834) or his wife, or an unknown relation or even sister-in-law but not his mother because of her age. Where to from here and what can be done from Australia? Action: Order in the microfilms of the Ardamine, Wexford valuation lists so I can trace the change of ownership of the two houses held by John Callaghan and Anne Callaghan in 1853. This might clarify the lines of descent, and correlate deaths with the transfer of occupation. Meanwhile let’s put together the BDM details that can be uncovered from Family Search, FindMyPast (world) and the National Archives of Ireland’s 1901 census. From the census: David Callaghan, a fisherman, 67 years old, Roman Catholic and illiterate. Living with him is his daughter Bridget, aged 33; his son, also David, aged 27 and a fisherman, David senior’s daughter-in-law Kate, aged 33 and her son David #3, aged 7. 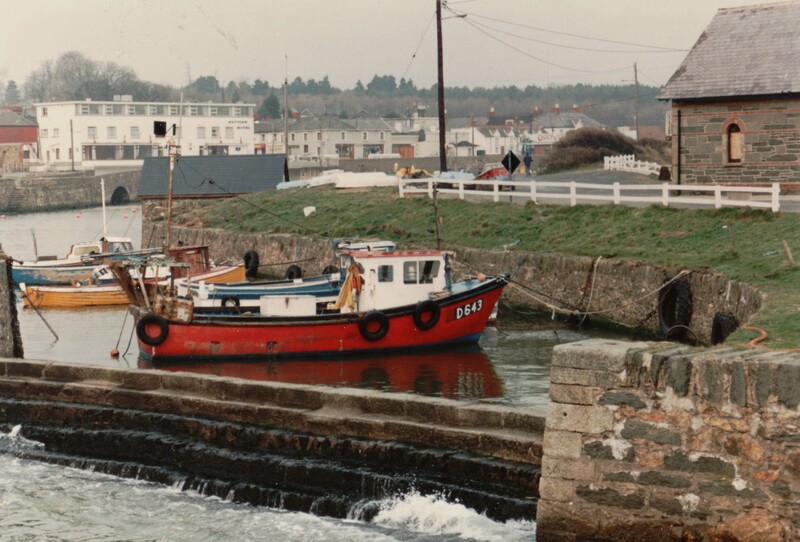 Courtown Harbour at 11am on 3 December 1989. Photograph by P Cass. I’ve come up with the following which remain conjecture until seeing the full detail on either baptism/birth/marriage/death registers. One thing that is explained by the Callaghan inheritance is why I’ve always loved fishing ports, especially ones with small boats, fishing creels and ropes. What is ironic is that no bells rang for me when I visited Courtown Harbour (why?) on 3 December 1989 with my mother and youngest daughter. David Callaghan b abt 1834 possibly died 1913, aged 78 July-Sept 1913. (Still alive at 1911 census). From the Irish birth registrations, David senior’s wife’s name is Anne but no maiden name is stated. David Callaghan #2 b 1874 born 21 April 1873 (Irish Birth Regn)[iii] and still unmarried in 1901 but in Oct-Dec 1908 he marries Mary Kinsella (vol 2, p727) and in 1911 is living at Riverchapel with his mother-in-law. Per the census enumeration, the couple have been married three years and have no children.David is now a sailor, not a fisherman. Action: follow up his merchant navy/navy records and the marriage record. It may be David Callaghan junior who dies in 1950 aged 71 (FMP), despite the variation in his YOB. Action: To follow up the marriage and baptisms when (??) in Ireland (the parish registers are not on Roots Ireland). Merchant Seamen’s records 1845-1854, BT113 from Findmypast ticket 246,956. Indexed on Family Search and FMP as Chard Callaghan. One possibility is that David Callaghan senior first went to sea with the merchant navy in 1840. 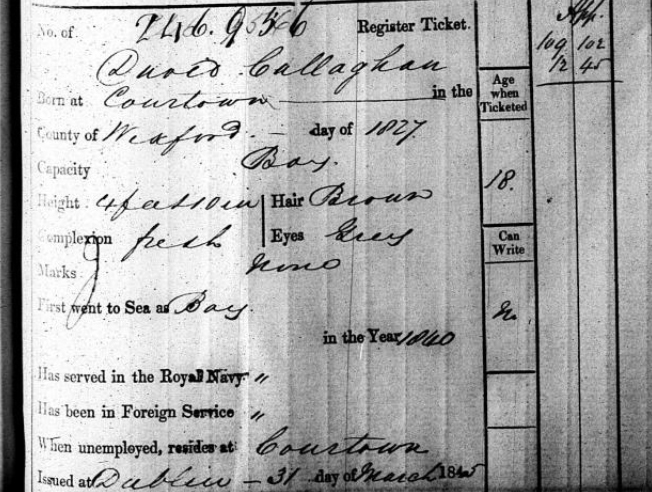 Certainly there is a David Callaghan, aged 18, ticketed in 1846. He was an apprentice, from Courtown and had gone to sea as a boy. He is described as 4ft 10ins, brown hair, grey eyes, fresh complexion and no marks. What stands out for me here is the lad’s height as his daughter was quite tall but perhaps he hadn’t grown fully, or it is the wrong person, or a cousin….or….The anomaly is the variation in his year of birth. The other Courtown resident in the 1901 census is John Callaghan, 62, living with his wife Catherine aged 60, sons Patrick 32 and James 23, and daughter Elizabeth Redmond 34, her husband James 35 and her daughter Mary, 9 months. John’s wife is Catherine Callaghan nee Cullen 60, est YOB 1841. She is still alive in 1911 but she may be the one who dies in 1936, aged 86. Margaret Callaghan was born in the southern Irish fishing village of Courtown Harbour County Wexford on 1 January 1874 (v2 p873 FMP)[iv]. It is this Margaret who is the wife first of the Rev Hugh Thomas and subsequently of Sigmund Rosenblum aka Sidney Reilly. One thing that bemuses me about Margaret Thomas nee Callaghan is that Cook says that in the late 1890s she’d have been taken as an educated, cultured Englishwoman of the Victorian upper classes[v]. Frankly it bemuses me how a young woman, said to have left home at age 14, would have been able to make the transition from a somewhat knockabout life in Courtown Harbour, to that of an educated and cultured woman, let alone lose her Irish accent and replace it with an upper class English accent. Although Margaret’s father Edward is said to be still alive in 1898 I can find no obvious trace of him in the 1901 or 1911 census records for Ireland. 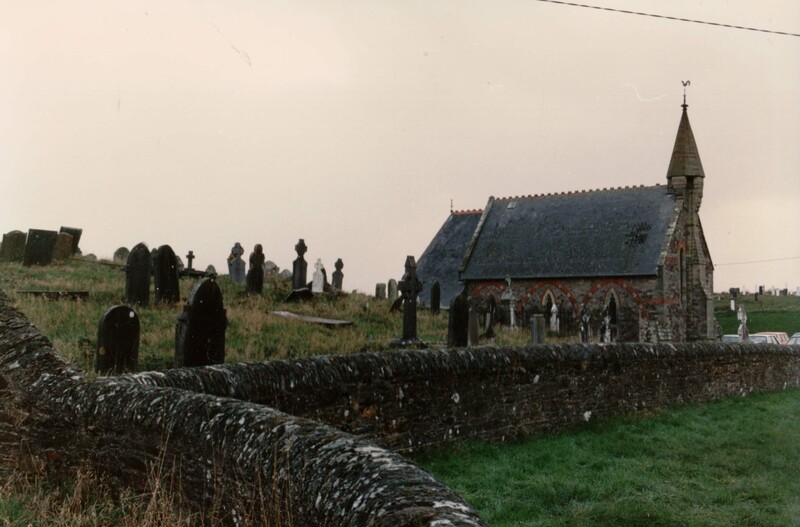 Courtown Church of Ireland, 3 December 1989. All the Callaghans were Roman Catholic. The chapel at which they worshiped no longer exists. I now have confidence that Mary Callaghan was born in Courtown Harbour and that her father was David Callaghan, a fisherman. It appears from the births of later siblings that her mother’s name was Anne. I have a hypothesis that the family of John Callaghan, living in the Oughton houses in Courtown Harbour is related, possibly her uncle, aunt and cousins. If the relevant facts in the Ace of Spies book are correct, and it does seem very thorough, further searching should find David, John and Edward in the Ballygarrett parish registers at the National Library of Ireland. Similarly the wife of the rather infamous and inventive Sidney Reilly would be my Mary Callaghan’s cousin. With luck, Ballygarrett research might reveal the links to other families whose DNA overlaps mine. Please read this story in conjunction with my earlier post, A Conjecture of Callaghans from Courtown. Keep an eye out for Find My Past’s release of further Wexford Petty Session records. Search for Ardamine cemetery records, which are supposed to be coming online through the Wexford County Archives. [i] Ace of Spies, The True Story of Sidney Reilly. Cook, A. The History Press, Stroud Gloucestershire, 2004. footnote 75 chapter 2. [iv] FamilySearch born 1 January 1874 to Edward Callaghan and Anne Nochter (sic). [v] Cook, op cit, location 614 of the ebook. I guess there are not many Australian family historians who haven’t discovered the joys of Trove, which get better with each expansion of the program (currently at 5 million pages!). Even so I was ecstatic at what I discovered through Trove yesterday. My McSherry families were historically concentrated in Queensland especially Townsville and Rockhampton so the online availability of the Townsville Daily Bulletin and the Rockhampton Morning Bulletin has been great for my research (microfilms not available here). I’ve picked up a whole range of snippets about my family, of which more in another post later. The auction notice for Peter McSherry's estate in the Rockhampton Morning Bulletin 10 February 1951 page 9. Trawling through Trove yesterday I picked up an advertisement in the Rockhampton Morning Bulletin which was probably better than finding my great-grandfather’s will. There in an auction notice was a full description of his home and belongings….a bit like hanging your world out for inspection by others. His daughter, Mary Ellen Quinn, was obviously executor of her father’s estate and she had put everything up for auction. Without having yet sighted the will it seems evident that Peter McSherry had left the property to his wife for her use until her death (1950) and then to be sold and the income to be shared between their nine surviving children. What the advertisement tells me is that they had a good quality home in a traditional Queensland vernacular style made of timber, highset and with verandahs on three sides, battens around the base of the house and a dedicated space downstairs for a laundry. What was a bit unusual was the scale of the house as with four bedrooms this made it above average, especially as they only moved into it with their adult children in their later years. Not surprisingly it was stated to be very close to the railway workshops and railway station in Rockhampton. Ironically it’s only now occurred to me that we went so close to their old property on the Sunlander train heading north several times. Dad would jump off at Rockhampton station just before the train stopped (another railwayman!) and cross the road to buy the world’s best fish and chips. Whether my mother knew where her grandparents had lived I don’t know –I don’t believe she ever mentioned it and she had only very rarely seen her grandparents as they lived in different places. Peter McSherry had joined Queensland Rail immediately on his arrival from Gorey, Wexford, Ireland with his wife (Mary nee Callaghan) and two small children, one of them my grandfather, James. Peter had probably worked for the railway in Ireland as his father also did. Over the years the family moved around Queensland from Longreach to Townsville, Hughenden and Rockhampton. He worked with the railway for nearly 60 years, right up to the absolute maximum age limit before retiring. (His son James similarly worked until old age). By the end of his career Peter was a Chief Inspector of Railways being responsible for the upkeep and general maintenance of a particular area of the railway lines. Railways run in the blood lines of many Australians and Queenslanders, perhaps in particular because of the extensiveness of the lines, and the correlation of railway construction with the commencement of the colony of Queensland. My generation is the first of five generations (on both sides of my family) in which no family member works in the railway, though other branches of the family have done so into the fifth generation. But all this is a diversion. As well as a full description of the house in this advertisement, an earlier one had detailed the property’s allotment number as re-subdivision 2, subdivisions 1 to 3, allotment 5, section 77, City of Rockhampton. Plainly this will need further investigation when next I visit Queensland. 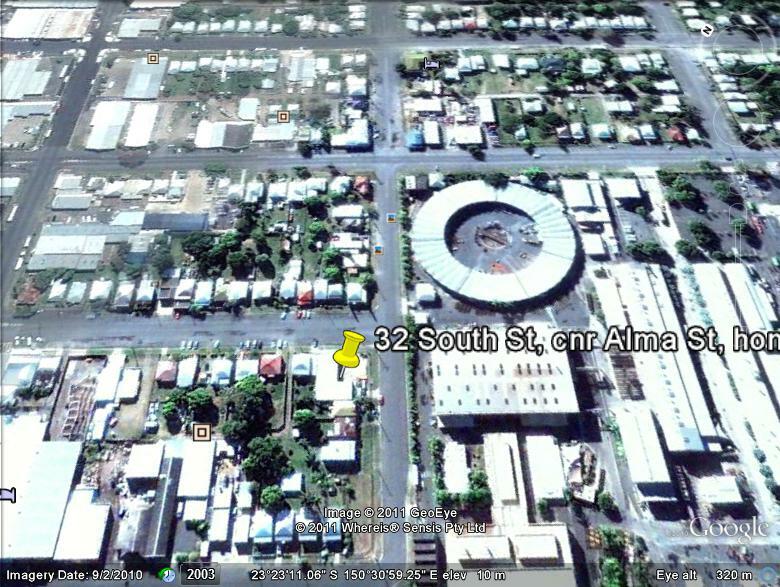 However I do know it was on the corner of Alma and South Streets with an address of 32 South Street. Thanks to a Google Earth search and street view, I now know that the house was obviously demolished at some stage and is now occupied by a battery business. The location is in close proximity to the heritage Railway Roundhouse with its distinctive shape as seen on Google Earth. Location of the McSherry family home on Google Earth. In the mostly Queensland wills I’ve found, I’ve very rarely located a very detailed inventory of belongings, though even the “overview” inventory can still be helpful. However where detailed inventories exist they provide such a great insight into the style and standard of living. I have not yet found Peter McSherry’s will –another on my “to do” research list for Queensland visits – but this advertisement is likely to exceed what I’ll find in the will packet, if available. The comprehensive list of furniture and household belongings being auctioned tells of a solid, working class living standard probably above that of the average worker. The house was kitted out with silky oak furniture, very typical of the times. Although not luxurious the extent of the furnishings tell their own story of a family who had done reasonably well since they’d arrived in Australia 65 years earlier. The items range from the comfortable to the mundane: Bookcase, squatters’ chair, seagrass tables and lounges, ice chest, copper boiler, commode and garden tools. The item on the list which saddened me was the sewing machine because it was regarded as a way of earning an income and therefore generally reserved from being recovered in cases of bankruptcy yet here it was being sold after the death of its owner, Mary McSherry nee Callaghan, about a year after her husband’s death. And what of the zinc lined piano case –had there once been a piano as well? So this Trove discovery has opened up new research paths and provided me with insights into the family’s living standards. All very exciting! UPDATE: At a recent (June 2011) visit to the Queensland State Archives, I found his name does not appear in the indices of wills or intestacies for the relevant period. So this Trove find really was a treasure.